Shabtai Kalmanovic, as he was known to the basketball community, was the President and the man behind the women’s basketball team Spartak Moscow Region since 2005. During his reign as President of the club, Spartak Moscow Region became one of the top clubs in Russia and became the champions of Russia in 2007 and 2008. They also dominated FIBA Europe's inter-continental competitions by first winning Eurocup Women in 2006 and then EuroLeague Women in 2007, 2008 and 2009. 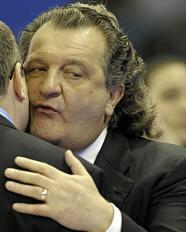 He was also the team manager of the Russian national team that won the silver medal at EuroBasket Women 2009. In his time as President he was known for his generosity which helped him attract some of the best women basketball players from all over the world to play for his club. Von Kalmanovic was born in the Soviet Union (today Lithuania) and moved with his family to Israel during the 1970’s. He made his first fortune and became one of the richest Soviet émigrés in the country. However he was given a 17-year jail sentence for spying in 1988 but did not serve the whole sentence and was released in 1993. Afterwards he came back to Russia and was soon heading a construction company that was to make him his second fortune.In 1999 he presided Zalgiris Kaunas, a men's basketball club, to win the EuroLeague men title.